Sometimes, being in the NBA comes with more responsibilties than you can imagine. Like a 8-hour commercial shoot. 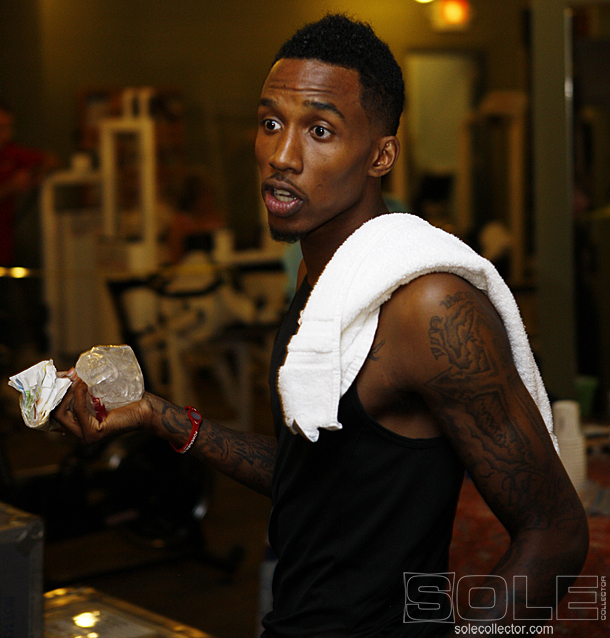 Under Armour’s latest commercial, featuring Brandon Jennings, is now live, and Sole Collector was on the set for the filming last month in Milwaukee. If you’ve ever thought the life of a pro athlete was all fun and games, then I’m not exactly sure where this fits in. 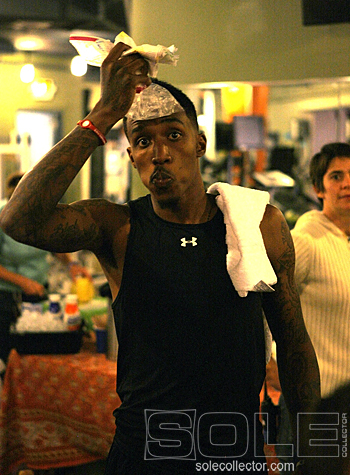 From our perspective, it definitely appeared to be a glimpse of a less glamorous side of NBA life. Even after a morning Bucks practice, the workday had just begun for Brandon. The commercial shoot began around 7 PM, and Nick DePaula and I lasted until about midnight. Brandon tweeted at approximately 3am that he’d just wrapped up. To make the shoot even more interesting, he narrowly escaped a potential major incident, after accidently clashing heads with a member of the Under Armour team between takes. Fortunately for Brandon, a bag of ice (standard ice, not black ice) was enough to keep the swelling to a minimum, and he was able to continue with the shoot. Unfortunately for Marcus Stephens, Under Armour's Senior Creative Director and the mind behind the company's advertising, he had to head straight to the nearest hospital in need of stitches to close up the cut he suffered from the head clash. For a video totaling only 15 seconds, there was an amazing amount of time, effort and people (nearly forty) involved. For Brandon, it was all in a day’s work. Although, I’m sure he’s glad there aren't too many of those days. Take a look at the finished product and some exclusive shots from the set below. 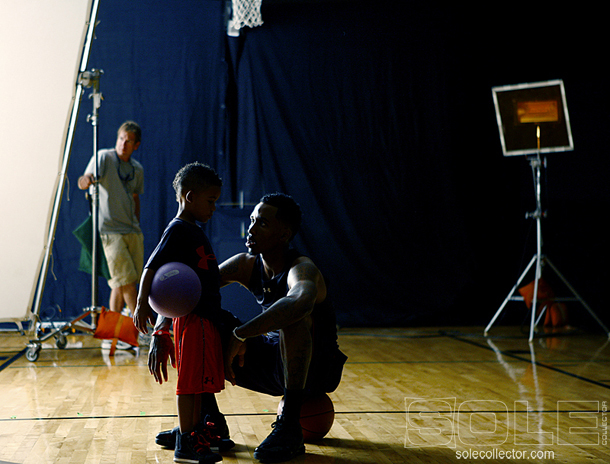 Under Armour Basketball | "I Think You Hear Us Coming"
Brandon visiting with a younger family friend on set. Throbbing head pain or not, the commercial shoot continued on well into the night. Kris Stone, Under Armour Director of Basketball, was there every step of the way. Brandon during one of many takes.